Lightweight Composite Structures in Transport: Design, Manufacturing, Analysis and Performance provides a detailed review of lightweight composite materials and structures and discusses their use in the transport industry, specifically surface and air transport. The book covers materials selection, the properties and performance of materials, and structures, design solutions, and manufacturing techniques. A broad range of different material classes is reviewed with emphasis on advanced materials. 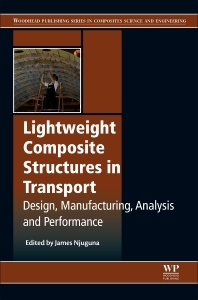 Chapters in the first two parts of the book consider the lightweight philosophy and current developments in manufacturing techniques for lightweight composite structures in the transport industry, with subsequent chapters in parts three to five discussing structural optimization and analysis, properties, and performance of lightweight composite structures, durability, damage tolerance and structural integrity. Final chapters present case studies on lightweight composite design for transport structures. R&D managers, designers, materials engineers and manufacturers in the aerospace, motorsport, defence and automotive engineering industries will find this an invaluable reference book. Dr James Njuguna has a long-standing interest and extensive research experience in advanced composite materials (and nanomaterials) for lightweight structural applications. He primarily focus on novel composite material properties improvement and optimisation for transport vehicles lightweighting, composite pipes & pipe in pipe systems among other lightweight design constructions. He has expertise on two fronts: (i) quantifying dynamic loading behaviour of structures such as failure mechanics, impact and crash, and (ii) hybrid composites reinforcement to improve dynamic performance and durability of composite applications .